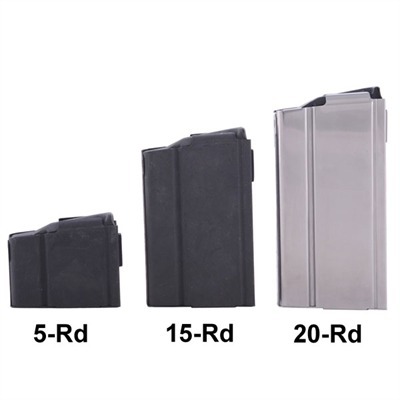 All steel, Parkerized or stainless steel magazines are built tough to provide dependable, reliable operation during competition and tactical ops. Features a welded magazine body, precision wound spring and steel follower to help ensure reliable feeding, plus includes a removable floorplate for easy cleaning. Models available in steel with mil-spec Parkerized finish that prevents rust and corrosion or weather-resistant, stainless steel. Polished stainless steel magazine includes a Teflon® coated steel follower. Available for the M14/M1A in 5, 10, 15, 20 and 25-round capacity. SPECS: Steel body and follower, mil-spec Parkerized finish or stainless steel body, Teflon-coated steel follower. This item is currently unavailable for backorder.